Do you still take the trailers out to events/parties? Yes, we still take Lucy and Ethel out to events/parties. You can email us at katiebugssipsandsweets@gmail.com for event pricing/booking. However, we are not taking anymore events until after August. Can you rent the trailers for weddings? Yes, we love doing weddings. You can email us at katiebugssipsandsweets@gmail.com for wedding pricing. Yes, most of our marshmallows are gluten-free with the exception of a few flavors. If they are gluten-free they are always marked. Yes, we use kosher, grass-fed gelatin in all of our marshmallows. Sadly, no. All of our marshmallows are made with kosher, grass-fed beef gelatin. How do you make them without using CORN-SYRUP? That's Melissa's secret! She would tell you, but then she would have to kill you. Do you have gluten-free baked goods? We do have them occasionally. We post on social media when we have them in our case. We take great care when preparing gluten-free items, but we are a small bakery and do not have a dedicated gluten-free kitchen. Please use your own discretion. can you get treats to-go? Yes, all of our sips & sweets can easily be packaged to-go. Is your shaved ice dye-free? Yes, our shaved ice, really all of our products, are dye-free. Our syrups get their color from the fruits, herbs, and teas that we use to flavor them. Any dyes that we use in our baked goods are all-natural derived from plants, vegetables, and fruits. Is your ice fluffy or Course/PEBBLY? Fluffy all the way! Our machine shaves the ice finely off the block so it's just like snow. It's the same machine they use in Hawaii and Japan. Do you have sugar-free flavors? We do have sugar-free flavors occasionally. We always post it on our social media when we have them. Follow us to stay up to date! Does your shaved ice have gluten? DO you have plastic spoons available? Yes, if wooden spoons aren't your thing we always have plastic spoons behind the counter. Do you have space for large groups? 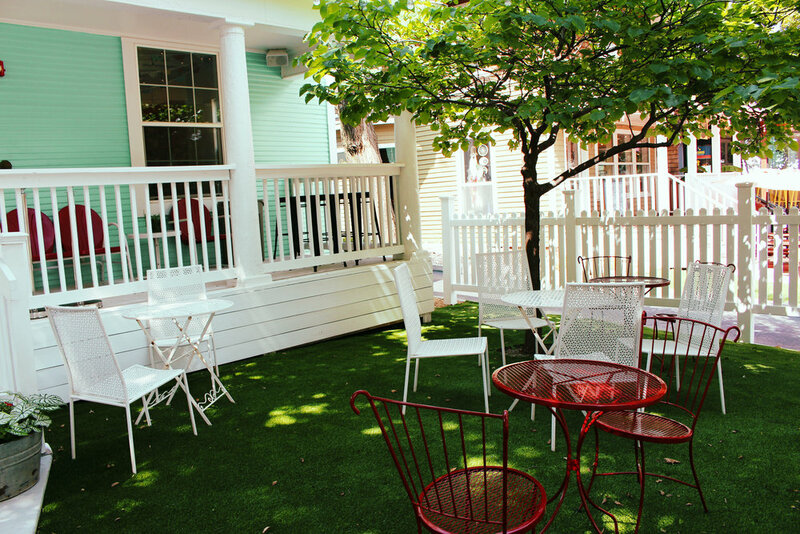 Yes, we have plenty of seating for groups including a 16 foot farm table outside on our front lawn that seats up to 20 people. Can I have a birthday party there if I don’t do a rental package? We would love to have you celebrate with us! You are welcome to come enjoy treats with your friends & family. However, we do not allow you to bring in decorations, outside food, or party activities without one of our rental packages. 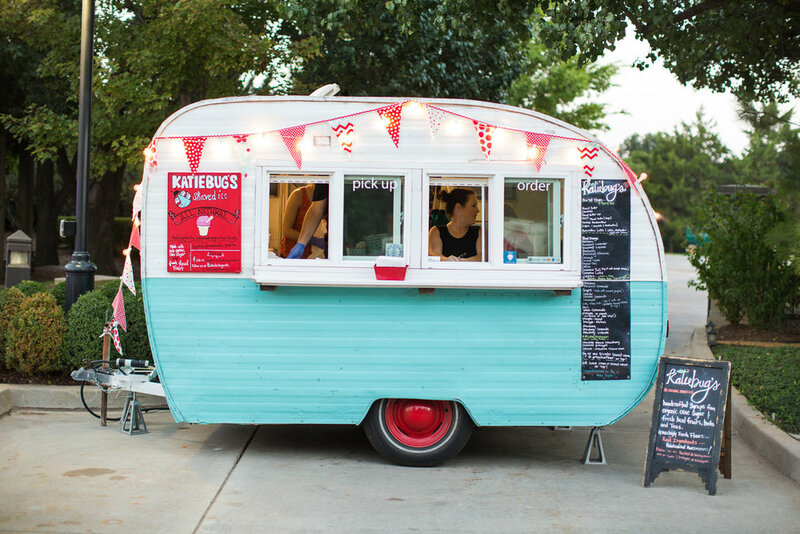 Can you rent Katiebug's for an event or party? Absolutely! You can click on the "Rentals" tab at the top of the page. That will give you all our the information and pricing for renting our space. Sorry! We don't allow outside food. do you have a handicap acessible enterance? Absolutely! Our back entrance is handicap accessible. There is also handicapped parking in the lot behind our building.